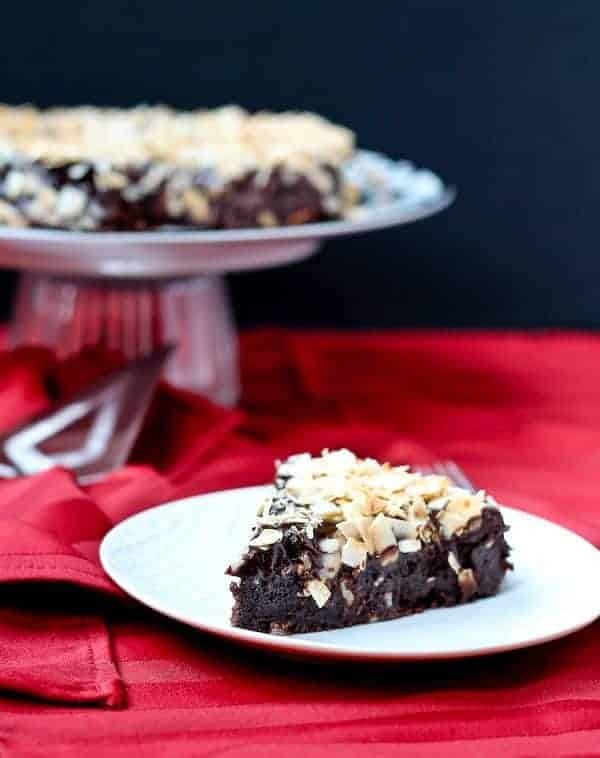 This flourless chocolate cake with ganache and toasted coconut is not only decadent, flavorful and delicious — but it’s also easy to make! Grab a glass of milk, folks. This is one rich cake – but it is worth every. single. decadent. bite. And can I tell you that I could use a slice of this cake right now? I’m all for a glass of wine or beer now and then but most nights? I’d rather have something like a slice of this flourless chocolate cake. E just got over a bug that lasted about 5 days and then of course just when things are looking up, N got it. How do people do it with more than two kids? Is your whole family ever healthy or do you just pass stuff around and around and around and around? My poor little man was battling a fever all day today, with his temp reaching 103.4. I swear, he always gets things worse than his big sister does. And both times I attempted to give him medicine today, he threw up right afterwards. TMI for a food blog? Probably, but that’s life. And I know a lot of my readers are moms and for moms…well, I’m not quite sure there is such a thing as TMI. So I’m writing this post, exhausted, stir-crazy, and headache in full-effect. I’m sure my mom will email me a whole laundry list of typos when this recipe hits her inbox in the morning. I can hardly see straight thanks to this lovely headache (doc calls them migraines but I can’t bring myself to admit that that’s what they might be). Buuuut it’s flourless chocolate cake with ganache. And I’m sure there are many, many, maaaaany people who had far worse days than I did. What kind of person would I be if I deprived them of this recipe for flourless chocolate cake with ganache? This chocolate cake can certainly cure many a bad day. 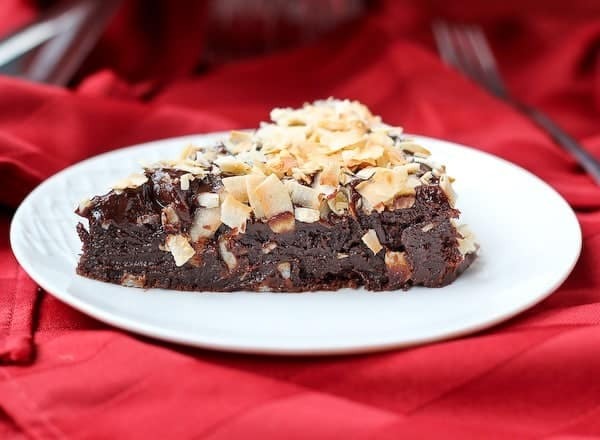 It’s fudgy and rich so a little goes a long ways, which is even better. More bang for your buck. That’s important on days like these. A shower after the husband gets home and before the kids go to bed. Mac & cheese and peas for the kids – good ol’ standby. You heard right. Lebanese carry-out picked up by husband. See, things are looking up already, thanks to a great husband and a little blue box. No, not Tiffany’s. Kraft! Nearly as good. Preheat the oven to 375°F. Lightly grease an 8″ round cake pan; cut a piece of parchment paper to fit, grease it, and place it in the bottom of the pan. 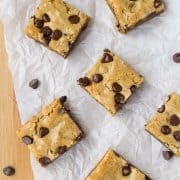 To make the cake: Put 1 cup of chocolate chips and butter in a microwave-safe bowl, and heat until the butter is melted and the chips are soft. Do this in 30 second intervals. Stir until the chips melt, reheating briefly if necessary. You can also do this over a burner set at very low heat. Transfer the melted chocolate/butter to a mixing bowl. Add eggs, beating until smooth. Add cocoa powder, and mix just to combine. Pour the batter into the pan you prepped. Bake the cake for 23 – 25 minutes – or until the cake reaches 200°F on an instant-read thermometer inserted into the center. Reduce oven heat to 350 degrees. Spread coconut on a sheet pan in an even layer. Put the coconut in the oven and toast for 10 minutes or until golden brown. Keep a close eye on it – it goes fast. 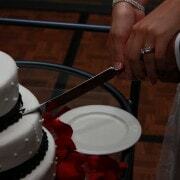 Loosen the edges of the cake from the pan with a knife or a spatula. Place a plate over the top of the pan and flip the cake out onto the plate. The edges will be slightly crumbly but that’s cool because they get covered with ganache and coconut. Cool the cake completely before adding ganache and coconut. To make the ganache: Combine the remaining 1 cup of chocolate chips and cream in a microwave-safe bowl, and heat until the cream is very hot, but not simmering. Remove from the microwave, and stir until the chocolate melts and the mixture is completely smooth. Spoon the ganache over the cooled cake, spreading it so that it runs over and covers the sides. Sprinkle the coconut all over the cake. Let the ganache harden before cutting and serving the cake. Verdict: What girl wouldn’t love this flourless chocolate cake with ganache? Husband’s take: No complaints heard from the peanut gallery. I think my neighbors were okay with me dropping off a couple slices too. 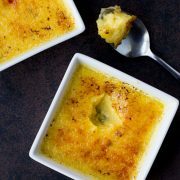 Difficulty: Make sure to read through the recipe before starting (always good practice) – but this recipe really is quite easy! Wow this looks good a cure in itself!! Also, Happy Mother’s Day!! Hang in there it will be nicer weather soon (I hope) and hopefully all this junk going around will die out! I hate it when my kids get really sick, cuz you have to be mom on steroids in order to survive and when it’s finally over you just wanta crash! Girl for reals, I could totally go for a slice of this right now. 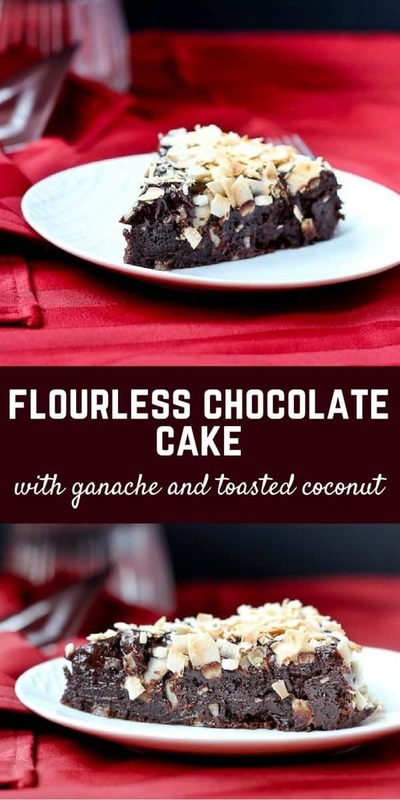 I adore flourless cakes, and this looks so rich! Aaw, I hope your kids feel better soon :( We were all battling a bug for the last few weeks too. 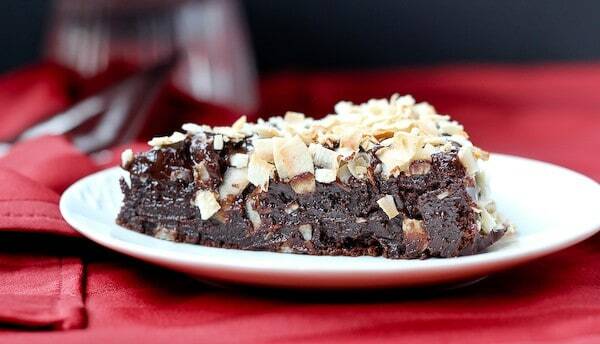 A rich chocolate cake is definitely in order. This looks perfect! 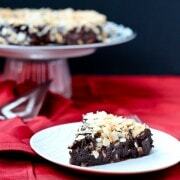 I love the toasted coconut flakes! I hope your little guy feels better soon! I can’t believe you found the energy to post after the day you had! My 3- and 6-year olds are always getting bugs. Luckily my 3 month old has been healthy so far except for a little cold. I could totally use a slice of this cake right now! This recipe is surprisingly simple. I thought it was as complex as it looks. But it turns out be pretty easy. I’ll make it this weekend. Thanks for sharing such an amazing recipe. oh holy heavens!!! 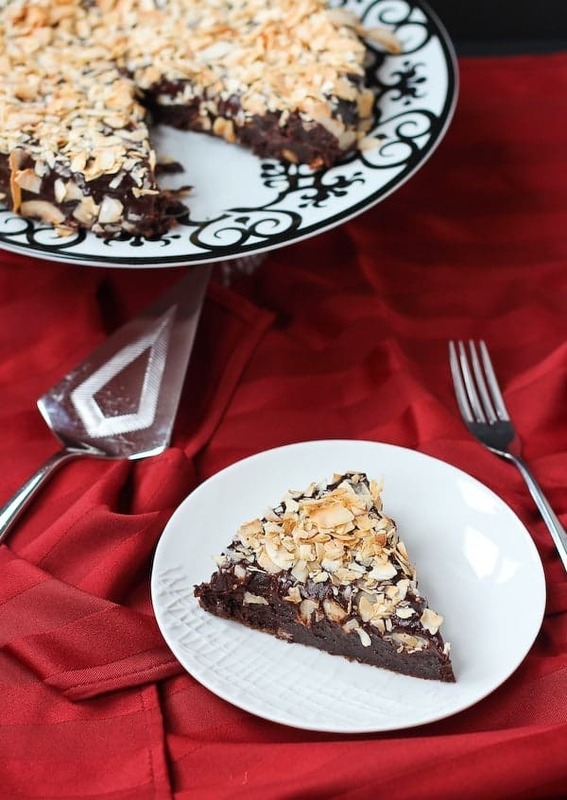 I LOVE how decadent and rich and chocolateyyy this cake is—and the coconut is a gorgeous, crunchy, addition! It’s hard with kids! I took our middle child to urgent care last night at 8 p.m. for an ear infection. (And really all I wanted was DINNER). I agree how to big families do it? This cake looks amazing! My MIL is gluten free and this would be perfect for her. Oh man, so sorry to hear your kids have been sick! Hopefully everyone is on the mend and you’ll be able to enjoy a nice Mother’s Day weekend. You totally deserve a huge slice of this cake, I can’t believe how rich and gooey it looks! Girl, I hope your kiddos get better quick and that headache disappears for you. I can totally see why a big slice of this awesome cake was necessary…I am dying at how rich and fudgy it looks!!! I’m going to need this in my life soon!! !